Looking for the perfect spot to host your Rehearsal Dinner in Central Virginia? Search no more! 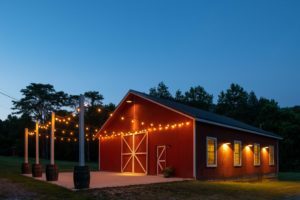 The newly renovated barn on the Orchard House Bed and Breakfast property has been the chosen location for several recent events, including Rehearsal Dinners. It’s easy to see why: our 2,000 square foot barn can comfortably accommodate up to 75 guests. It includes two beautifully appointed restrooms, a catering prep area, chandeliers, distinct lighting features, a sliding barn door, and a gorgeous outdoor patio. The barn is surrounded by mountain views, and our 14 acre property includes an active vineyard, two separate houses for accommodating up to 18 guests, a new salt water swimming pool, a new gas fire pit overlooking the mountains, and a one-mile hiking trail. Provide your own caterer, or work from our list of preferred vendors. We provide tables and chairs for up to 75 guests, and several banquet tables as well as hi-lo cocktail tables. Call us today for your private property tour, we’d love to help host your Rehearsal Dinner or event!